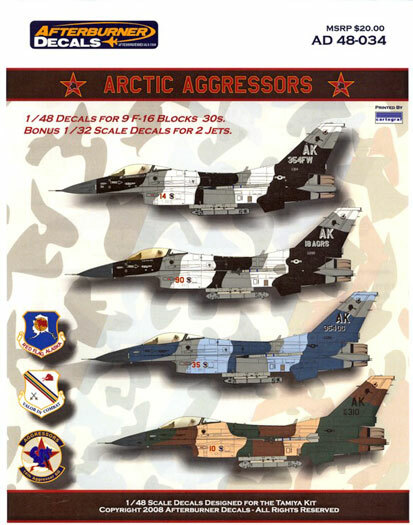 A great one stop shop for the latest USAF Aggressors in all three schemes, plus a bonus of some 1/32 options all in one package. From a nadir at the turn of the century when the USAF Aggressor program had been reduced to a handful of F-16s of the 414th CTS at Nellis AFB, the period from 2005 to date has seen a marked resurgence firstly with the 64th and 65th Aggressor Squadrons flying F-16s and F-15s respectively and now in 2007/8 with the establishment of the 18th Aggressor Squadron specifically to support the USAF Red Flag Alaska program. This program has resulted from a combination of pressure on training areas in the Nellis Ranges and a need to expand access to new partners. The result has been the old Cope Thunder series now providing the broad tactical training that was previously the preserve of Nellis. When the first arctic aggressor schemes began to be seen in Korea on jets designated for the 18th, the modeling community was abuzz. Aggressors had always provided a colourful option for otherwise plain gray subjects, but the new scheme took it to a whole new level. It is of course natural after releasing sheets for the 64th and 65th Aggressors that Scott Brown of Afterburner would provide an equally impressive sheet for the 18th, especially after having the opportunity to visit them in person during RF Alaska 08. 48-034 provides decals for no less than 9 18th Aggressor F-16s, along with 2 in 1/32 scale. 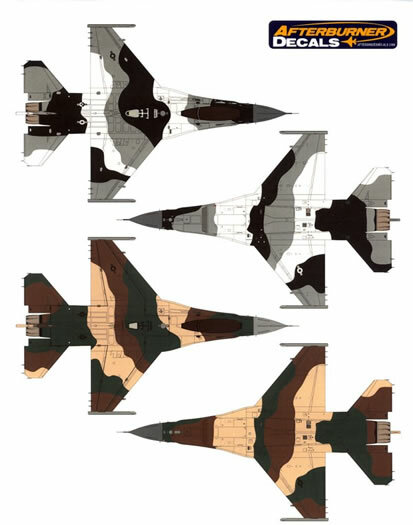 Again they have done an exceptional job providing decals for three camouflage iterations of the jets, capturing them as they appeared in their first exercises in 2008. The decal options are provided on one A5 size sheet with a second for complete stenciling for two jets in each scale. AF86-0290, 18th Aggressors Commanders jet 2008 – “new” winter scheme. AF86-0305, 18th Aggressors line jet 2008 – “new” winter scheme. AF86-0301, 18th Aggressors line jet 2008 – lizard scheme (also provided in 1/32 scale). AF86-0310, 18th Aggressors line jet 2008 – lizard scheme. AF86-0335, 354th Ops Group jet 2008 – flanker scheme. 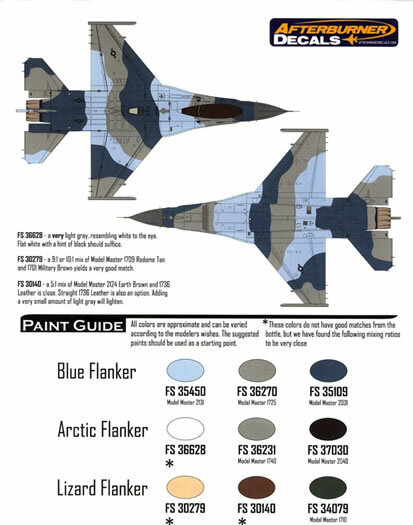 AF86-0298, 18th Aggressors line jet 2008 – flanker scheme. AF86-0322, 18th Aggressors line jet 2008 – flanker scheme. All subjects have large clear instructions (10 A4 pages worth) associated with them including full colour profiles of both sides, top and bottom of all three schemes. In addition there are detailed notes for stencil placement, the stencils themselves being clearly numbered to avoid errors. All prove very useful for getting a model spot-on. If the instructions are not enough there is a 113 image reference photo library linked off the Afterburner Decals page for the aircraft depicted. 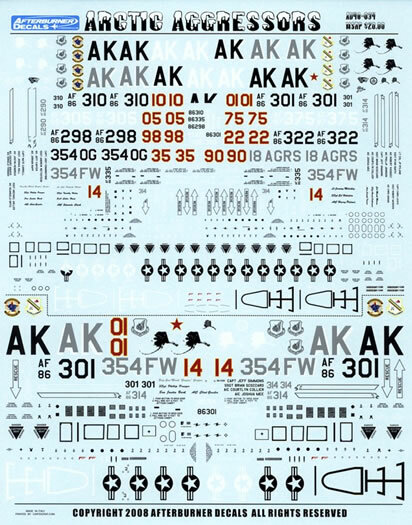 The only drawback noted is that two sets of Alaskas in 1/48 and one set in 1/32 have been inadvertently printed in white, resulting in limiting the number of complete 1/48 options available on the sheet as is to 2 and to one in 1/32 scale. A minor problem unless you plan to model the entire Squadron equipment at this time. Like all new Afterburner sheets, the printing has been done by Italian company Catrograf. The quality looks extremely good with registration spot on. These sheets are sized for the Tamiya F-16C kit. Unfortunately you will have to combine an F-16CJ Block 50 and F-16C Block 25/32 kit to get the details right for an 18th Aggressor Block 30 (something which you also have to do in 1/32 scale), something that could prove quite expensive, but as a bonus will leave you with a Block 52 for which there are many other options available. That said this sheet itself represents good value for money and reflects Afterburners commitment to a high quality product. Thanks to Afterburner Decals for the review sample.